We believe that people with disabilities should be able to develop their potential and improve their feelings of self-worth. We aim to provide professionally run opportunities for guidance, education, and life experience, to build on day to day living skills. We will prioritise individual choice in activities to support personal development. With the right help, everyone can contribute to his or her own decision-making. We want to create an environment to maximise personal autonomy, whilst honouring our responsibility in the decision making process. Communication is vital to all human relationships, and can take many forms; including language, signs, symbols, demeanour and body language. We will maximise and respect each person’s communication style. We will use community facilities which allow everyone to participate fully, and our own premises will act as a secure base from which all activities can be accessed. 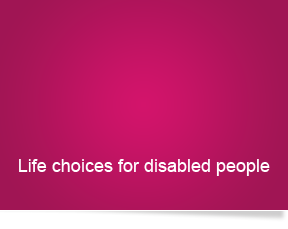 As an organisation, we are committed to supporting disabled people with dignity and respect.